The government wants councils to look to London for leadership on cycling. We might have nice yellow bikes. But this woman has just given up on trying to cycle here. This needs to change. According to today's edition of The Times, "Norman Baker, Transport Minister, and Mike Penning, Road Safety Minister, have sent a letter to every council leader or chief executive asking them to make the changes. “Cycling has risen up the political agenda in recent weeks, not least due to the excellent campaign run by The Times, and we are keen to seize the moment to make good progress on a number of fronts,” they write." You can read that letter in full here. As it happens, ministers, cycling has been rising up the political agenda for more than a few weeks. 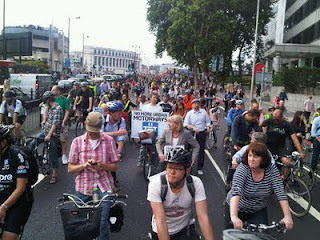 For some reason, the UK is packed with people blogging and campaigning on cycling issues. There's something odd about cycling in the UK and the fact that it needs to be a political issue in the first place. If you look for blogs about cycling in Germany or the Netherlands, you don't find all that much to read about. Yet, look for blogs about cycling in the UK and there are loads of us writing about local government, about national government, about crap cycle lanes, about lousy infrastructure. None of us started out to be 'campaigners' or to be 'political' per se. But I think (I hope no-one takes issue with me on this), most of the bloggers and other commentators on cycling in the UK would agree with this editorial in The Times last Thursday, when the Times said this of its #cyclesafe campaign: "Success would not be a dip in statistics, and a few stretches of road painted blue. It would be a fundamental change in the popular expectation of how British cities ought to look." Absolutely spot-on. The Guardian backed up comments by The Times. It described the mentality of UK transport policy which says: "roads are for getting cars from A to B as quickly as possible and everyone else can fend for themselves". I think what is happening is that people are increasingly saying, 'No! Roads are not just for getting cars from A to B as quickly as possible'. The issue is that people want alternatives. They want to cycle safely. They also want walking to be more convenient (not three minutes for the pedestrian crossing lights to change. Or worse, for the pedestrian crossings to be removed as part of a policy to speed up motor traffic, as is happening in London at the moment). What we have instead is the Ministers who work in the Department of Transport washing their hands of it and saying it's all up to local councils to sort out. Oh, and they should do this by seeking sponsorship for bike lanes. In other words, not our problem, says the DfT. And so I believe that several other commentators are right to point out that they are less than optimistic about the government's response. Cycalogical wrote a very good piece along those lines here. I suppose the question is, will MPs actually do anything? What's more, will the government, through the Department for Transport, actually do anything? I'm afraid that the letter penned by Ministers Baker and Penning doesn't reassure me. In that context, I think it's time to show Ministers that this is a really, really big deal for a lot of people. And that these issues aren't going away. It's a problem that's going to get bigger and louder. Last year, Mark of ibikelondon blog and I worked with several volunteers in London Cycling Campaign to organise a series of Flashrides at Blackfriars Bridge. These rides saw over 2,500 come together with only a couple of days' notice each time to protest at the way London's Mayor has designed them out of one of the busiest bicycle bridges in London (36% of rush hour traffic on Blackfriars Bridge is people on bikes). If politicians can ignore people on bikes at a place like Blackfriars, they will have no qualms ignoring people on bikes elsewhere in London and the rest of the UK (notable that in Scotland and Wales, where power is devolved, things are taking a different direction). For those of us in England dealing with the UK parliament, things aren't looking too positive yet. So, I think it's time to show there are more than a couple of thousand of us. On Saturday April 28th, the London Cycling Campaign is organising The Big Ride (twitter #thebigride). The Big Ride aims to be the biggest mass participation bicycle ride in the UK ever. I hope that we can gather over 10,000 people to this ride. I'm going to invite everyone I can think of, my friends and my family, to join and to make it a really fun day for everyone. The ride is a week before London's Mayoral elections and it's about sending a message to the Mayor and to all UK politicians that cycling is here to stay. The London Cycling Campaign has released details about the ride on its website here today. I'd urge you to join me and 10,000 other people to push for cycling to be taken seriously in our streets and on our roads. And that, Messrs Penning and Baker, means you need to do more than send a nice letter to council leaders. It means you need to actually deliver this yourselves. I'm planning to join one of the feeder rides to #thebigride and asking my friends and family to join me on that feeder so they don't feel threatened by cycling in London (most of them can and do cycle but most of them won't cycle in London though). I'll have more details on that soon. You're all welcome to join whichever feeder ride suits you. By the way, if you have thoughts and ideas about what government ministers should be doing for cycling (other than writing polite letters shoving responsibility on local councils), please let me know. I'm very interested to explore some of these ideas. It is worth pointing out that LTN 2108 , which he refers councils too, has its limitations. I also think that the DfT, while it should be more permissive in terms of new (for the UK) ideas (by having, for example, a sign and markings for cyclists to perform hook turns where normal right turns are banned or may be difficult), needs to be much more prescriptive about minimum standards. I have an "Architect's Pocket Book" which surmises the most important bits of building regulations and has details on minimum dimensions, drawing conventions, utilities, etc. I wonder if there is such a thing as a "Pocket Book for Cycle Facilities", because you could cram a lot of useful stuff in; such as spacing between Sheffield stands, the "road user hierarchy" Boris dropped, a table of traffic speed v traffic volume with the corresponding cycle facilities, and the minimum cycle lane width (if I as a first year student can remember that 42 degrees is the maximum pitch allowed for a domestic staircase, and that a wheelchair accessible bathroom needs 800mm of clear space beside the toilet, I wonder how people with actual jobs can "forget" that cycle lanes should be 1.5 m wide as a minimum). Get it right. LTN2/08 says "A minimum width of 1.5 metres may be generally acceptable on roads with a 30 mph limit." It doesn't say "should", because there's actually sod all evidence that 1.5m is required. Unfortunately I can't remember on which blog I read about this recently, but I thought that the 1.5m 'standard' came about from the average width of a bike, plus the extra required to allow deviation from a straight line and with a 'buffer' from traffic. 1.5m isn't really all that much to my mind. Are you saying less is enough? It is perfectly possible for two people who are reasonably slim to sleep in a normal sized single bed. It does not therefore follow that a hotel should advertise a double room which only has a single bed, on the basis that two people might fit in it. Likewise, it is possible for most types of bicycle to be manouvred through a space noticably less than 1.5 metres wide. I do so all the time when filtering past queues of traffic. It does not therefore follow that a lane less than that can be considered adequate for the safety or comfort of cyclists. http://webarchive.nationalarchives.gov.uk/tna/20111212185740/http://www.dft.gov.uk/pgr/roads/tpm/ltnotes/ltn208.pdf This I think is the document Chris is talking of. None of it is legal requirement as far as I understand (I could be wrong). I think perhaps there is scope for a specific team to be set up to deal with cycling. People who know the regulations/guides and how to best implement them. Expensive for a single council to operate but workable if they can float between several and are employed directly by the DFT or a private contractor. It cost (relatively) peanuts, but when CE was abolished the advice service team was wound down early and disappeared along with CE itself. It was universally appreciated and indeed was mentioned in most if not all of the letters calling for CE to be kept. The majority of the team are still around (some may even be reading this comment) and it would be relatively easy for it to be reassembled if the will was there. Problem is how to do it without it looking like a government u-turn. As for LTN 2/08, unsurprisingly there has been many changes in cycle planning since it was drafted in 2007 (some 5 years ago) not least in the overall approach and attitude to design. 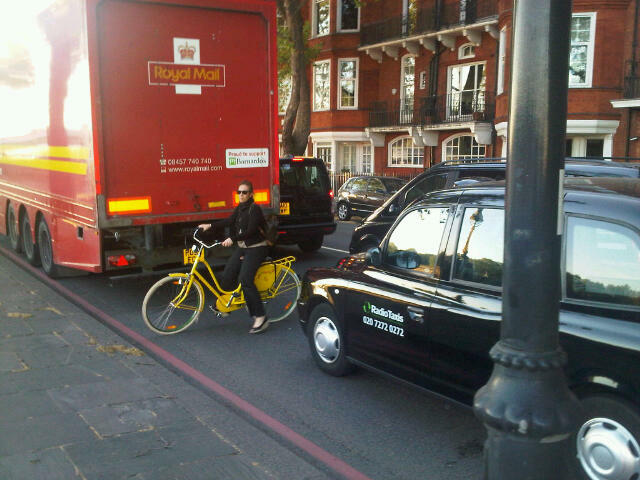 However it and London Cycling Design Standards (plus Mfs/MfS2) still remain important. The problem is that they are NOT standards but guidelines. The world being what it is there will always be places where something is better than nothing, and other places where nothing is better than something! However people do need to know best practice BEFORE they should decide to ignore it. That's why training of professionals remains important, and strangely neglected. "my colleagues were part of it and *I* did a small amount of work for it". They did a LOT of work for it! Oh the joys of localism! What better way for a minister to kick this into the long grass than to leave it to the Tufton Buftons of yer average Tory (or for that matter Labour - I might make an exception for LibDems) local authority? Especially if it's like good old Haslemere, Surrey, where any suggestion that you should control on-street parking leads to howls of outrage from residents (except of course the residents on the streets proposed for controls) and bicycles are strictly for off-road up on the common. At best we will get some good facilities which simply terminate at the local authority boundary, just as crossing the county line can often lead to a marked change in the quality of a road surface. On that point, I guess there must be some statutory obligations on county councils to provide and maintain the non-trunk roads (that is most of them) which fall outside the Highways Agency's purview. Should there not be similar statutory responsibilities for footeways and cycle tracks, not merely to set minimum standards but to insist that they are installed, eg along the lines of the Danish traffic volume/speed matrix? The feeder rides are a great idea, thanks for mentioning them. I am coming from Cheltenham and will make a weekend of it. I suggested bringing the whole family and our tandem, but Mrs. Don isn't so sure. I'll have to work on that one! Not entirely on-topic, but I have heard of what I think is an Australian idea – bike hour, when everyone who has a bike just rides it, no particular place, route or anything, just get on and ride, normal clothes, lycra whatever (though some clothes a good idea,given it’s March and we’re trying to be normal). Is anyone doing it here?